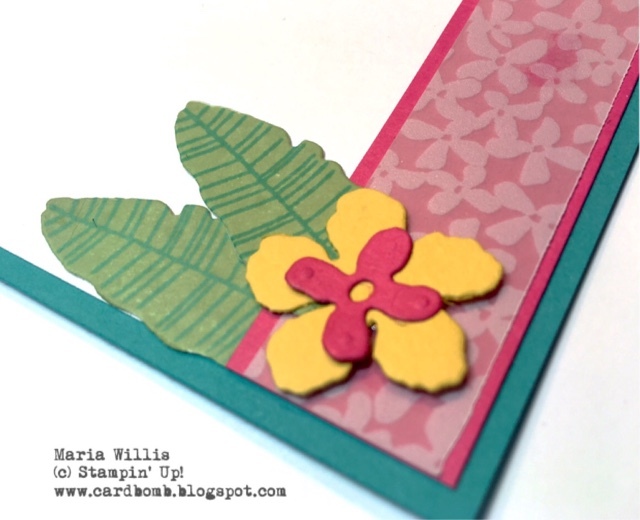 It's Botanical Blooms week over at What Will You Stamp?! When I first saw the Occasions catalog this is the stamp set that I immediately fell in love with! I am so glad that we get to feature it this week because it is so much fun. 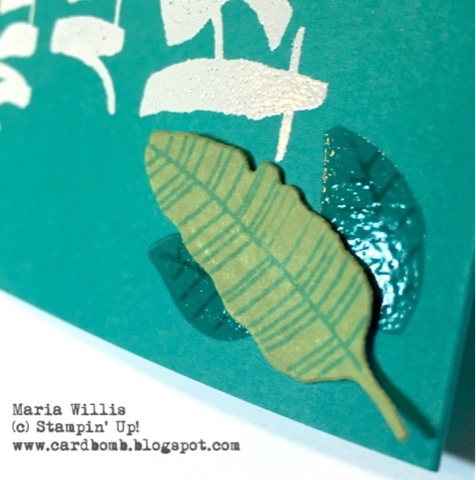 To make the larger leaves on the front of my card I stamped in Wild Wasabi on Whisper White card stock. Then I used Tempting Turquoise to stamp the "veins" of the leaves. I love this color combo! It really pops! For the shiny leaves you see in the background, I first stamped the "veins" in Bermuda Bay (my card base is Bermuda Bay) and then I heat embossed in clear over the top. I wanted to give the card some subtle background detail and this ended up being really fun. 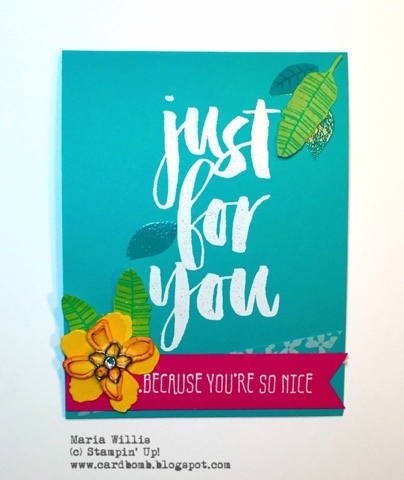 The sentiment on my card comes from the Botanicals for You set that you can earn FREE with any $50 USD purchase! Yeah, really, buy anything you want in any of the Stampin' Up! catalogs and for every $50 USD you spend you will receive a free product of your choice from the Sale-a-Bration catalog! 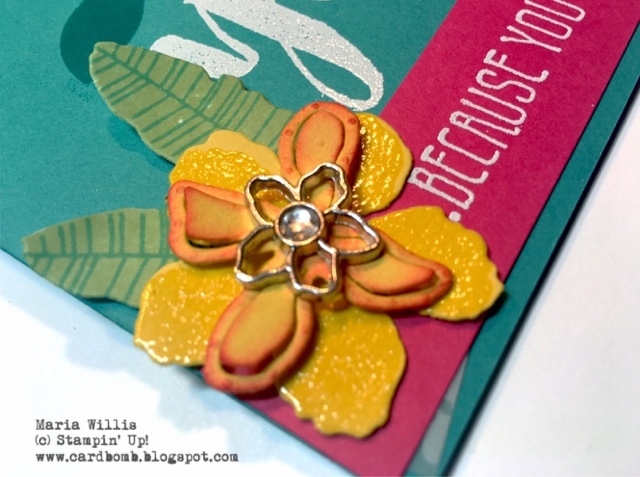 It's a little hard to tell but I also stamped and heat embossed the Daffodil Delight flower in clear before layering it with the sponged layer and the beautiful jeweled embellishment. Here's a close up of the leaves in the top corner of my card. 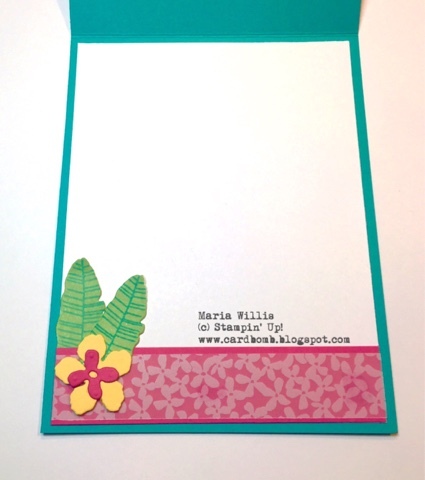 See how I stamped first, then clear embossed, then layered with the separately stamped leaf? Fun! Also, super easy since the Botanical Blooms set has a coordinating set of framelits! No fussy cutting these little beauties out! Here is the inside of my card... I layered the bottom with Melon Mambo and the pretty vellum strip on top of that is another FREE item you can get when you spend $50 USD! I'm kind of a sucker for vellum so this is one of the first things that I picked up. Here's a close up of the flower on the inside of the card. I used the frailest to cut out the flower shapes in Daffodil Delight and Melon Mambo then layered them with the leaves. Very easy! In case you have not seen this amazing set yet... Check it out! And don't forget it has coordinating framelits! If you buy the stamp set and the framelits as a bundle you will get a 15% discount (just choose the bundle when purchasing). This bundle is $51.75 so purchasing it automatically qualifies you for a FREE item from the Sale-a-Bration catalog! You saw two of the free items that I picked...I'm wondering what you love from the SAB catalog? Please let me know in the comments below. Have an amazing day and if you already have this stamp set then please show us what you got! 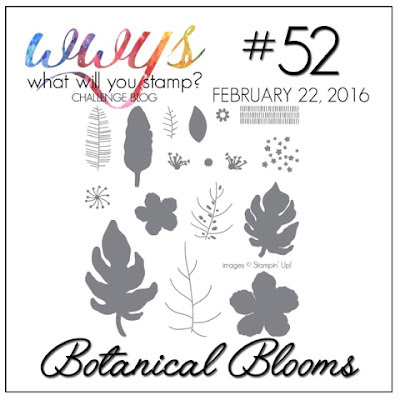 Play along with us over at the What Will You Stamp? challenge blog this week! *For a limited time only you can get $155 worth of Stampin' Up! products for only $99! Just ask me how-and in case you're wondering, there is no catch! I love love love this card Maria!! 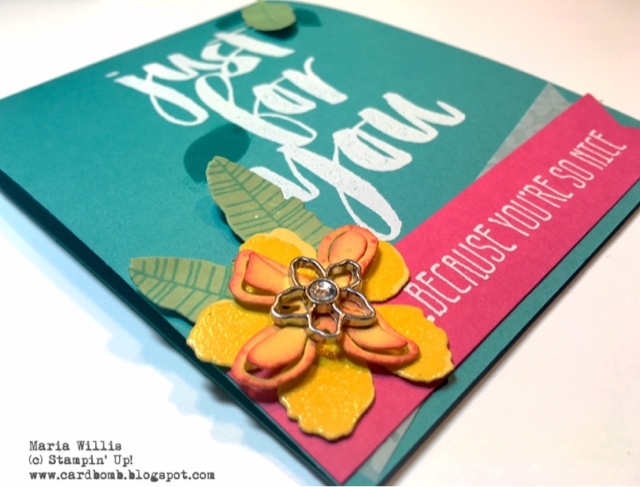 I love the bright colors on your card. Very striking. I love it! !